The cemetery would be destroyed by vandals in later years. 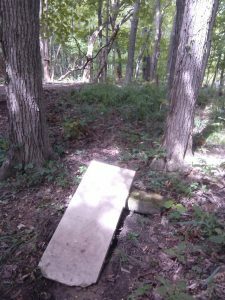 Surrounded by private property and hidden away on a wooded hill, this pioneer burial plot continues to deteriorate. Long a concern of mine, I made it a point to visit the site on two occasions in July of 2017. Indeed, it was even worse than it had been some years ago when I had last seen it. A simple `welfare check’ turned into a cleanup as I decided it was finally time to reestablish the site as a cemetery. Leaves and brush were raked away, branches and dead wood piled up, and the area partially cleared of small trees and bushes. Stone pieces were identified, laid together, and several bases located. On my second day there, I noticed a rectangular stone which was clearly not just a rock. 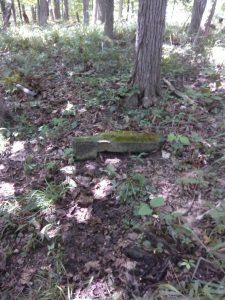 A closer investigation revealed a slot for a headstone which indicated that it was a tombstone base. Poking around the area with a soil probe led to the tombstone being located which belonged to this base. Buried under several inches of topsoil was a headstone in almost pristine condition. Local researcher and Liverpool Township resident Terry Hart has been hunting down veteran graves for years. He has published several books on the subject and I have been fortunate to exchange information with him many times over the years. His book on the War of 1812 veterans buried in Medina County includes a list of known veterans whose graves could not be located. I happened upon this list again just recently and noticed a familiar name on it: Daniel R. Smith. 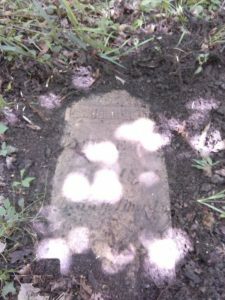 Turns out the stone I found was for a War of 1812 veteran. Born in Vermont, Daniel served in the Vermont Militia. 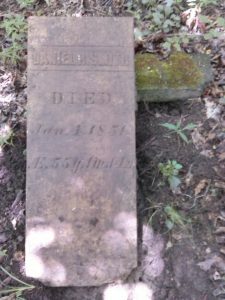 Furthermore, his wife Sally was still living in 1860 in Lafayette Township with their son’s family so her grave may yet be found here also. I was happy to inform Terry of the find and it is yet another example of how networking among researchers continues to break through brick walls in our research. A lack of time and other life events did not allow me to return again to the cemetery in 2017 but I plan to return and finish work on restoration and cleanup in 2018 once spring arrives. Perhaps the stone for Daniel Smith can be reset someday and stand once again on the hill. Either way, his burial place has been documented and will never again be lost to history.